The MiniVAP can be considered the Volcano of portable vaporizers, at least in terms of quality. However comparing the actual operation of these two units would be rather difficult, as they each provide different methods of vapor administration… both units have been laboratory tested for efficiency and purity. The size of the MiniVAP is on the larger side of portable vapes, but it seems to work well with very few performance flaws. Honestly, it looks like an Arizer Solo on steroids, as it is easily two times the height. Produced by Hermes Medical Engineering out of Spain, the MiniVAP is really starting to catch on in the West. It is available currently in black, silver and gold; however the manufacturer is anticipating the release of a wide variety of color options. The MiniVAP includes the battery, heating chamber and lid; these pieces comprise the actual unit itself. Each package also comes with replacement screens, an oil disk, the herb cup, two silicon tubes, a cleaning brush and two different mouthpieces. Also included is the charging dock that the battery connects to when it is time for a charge. Plus the MiniVAP is stored in a very nice soft style camera bag that makes portability a snap. Charge up the battery and once complete, connect to the body of the MiniVAP. Turn the unit on by pressing the plus and minus buttons. The light below the MiniVAP logo will begin to blink and the back light displays the battery level (more on that further into the review). The plus/minus buttons are then used to select the desired heat level. Wait until the front light stops blinking to confirm it has reached the temperature. Inhale continuously for five seconds or longer. Exhale the vapor and repeat as desired. After 10 minutes without use the MiniVAP turns to the blue and completely off after 20 minutes. Holding down the plus/minus buttons will also turn the vaporizer off. 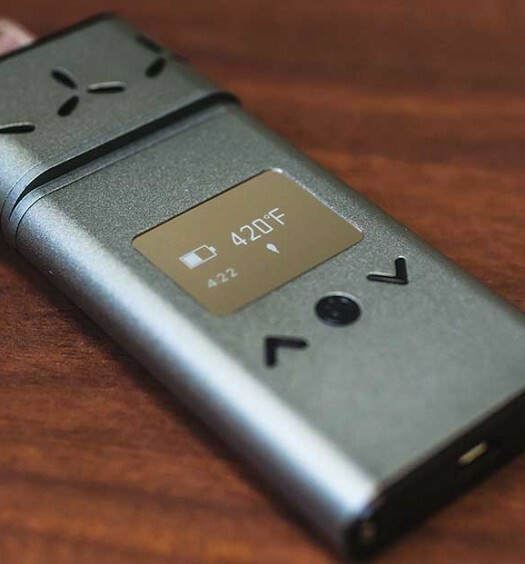 The style in which the heat is distributed within the MiniVAP is one of the features that make it unique from other portable vaporizers. Most vaporizers use turbulent heat flow, which can produce cross currents that incidentally cool the air on one side of the herb in the chamber. 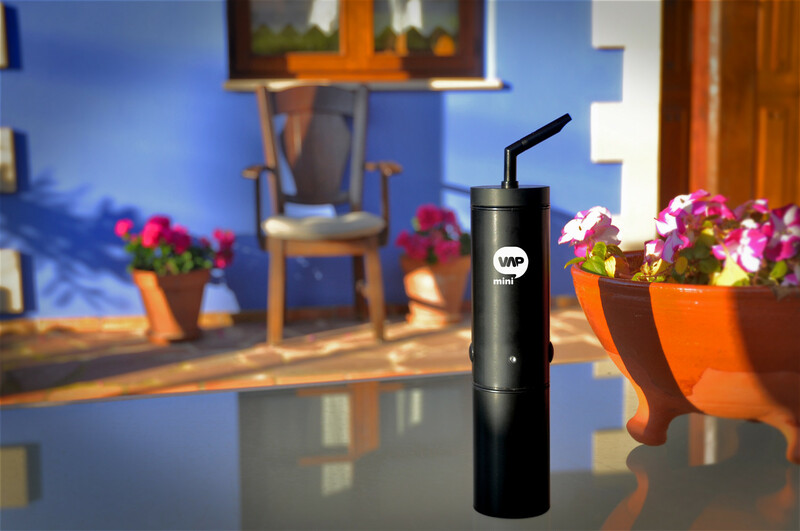 The MiniVAP utilizes laminar heat flow that allows the heat to pass around the whole surface area of the herb. This style is far more efficient, considering that more surface area being heated will lead to thicker vapor production. Laminar heat flow is great for the connoisseur who really wants to taste their herb. WHAT DO THE DIFFERENT COLORED LIGHTS REPRESENT? The MiniVAP does not feature a digital display, but rather relies on different colored lights to distinguish the exact temperature setting. As with all vaporizers, you will want to start at a lower temperature (374ºF) and work your way up until the desired vapor production is achieved. The chart below will help you determine the perfect level. Remember that if you are going to be vaporizing concentrates with the included mesh cup that a higher temperature will be best for optimal performance. So, what about the light on the back of the MiniVAP? Well those different colors represent the battery level and how much life remains before you will need to recharge the unit. Battery life will vary depending on how frequently the unit is turned on/off. Another factor that will affect how much use one charge provides is what temperature it is running at. A higher temp requires more of the charge to reach and then maintain. So if you plan to exclusively use oils, expect a shorter battery life each time. The MiniVAP can be used while connected to the charging dock. There is also an additional adapter available that allows for use without the battery connected, sort of creating a plug in vaporizer. The battery does charge up rather quickly and I rarely found the need to use it while on the dock. The adapter is great for those who want a plug in vape that can be held in their hand during use. Plus the adapter removes the battery pack, which adds a lot of weight to the MiniVAP. DOES IT WORK WITH CONCENTRATES? Yes the MiniVAP does indeed work with waxy concentrates. There is a dense mesh screen that is included with the unit that holds the concentrates on it. This is then inserted into the heating chamber in place of the herb bowl. You will want to run the MiniVAP at Red, the highest temperature setting available. Start with smaller amounts of your concentrate when using it for the first time. Every concentrate is different and as a result will vaporize in its own way. A thicker waxy concentrate will work best in the MiniVAP. WHY THE STEEP PRICE TAG? The high quality of the MiniVAP is directly reflected in the cost unfortunately. It is certainly one of the best in terms of vapor production, but it is quite expensive if portability is your main goal. There are other portables out there that work really well and are a fraction of the size. The heating chamber operates in such a manner that removes all of the properties from the herb and leaves nothing for waste. This efficiency will save a lot of money that would be spent on herb in the long run, as a smaller amount of material lasts longer in the MiniVAP. The first thing you notice when picking up the MiniVAP is how solid it feels in your hand. This is certainly not a cheaply constructed vaporizer and that is quickly apparent. However this solid feel also adds a lot of weight to the unit. It is not the easiest portable vaporizer to take out on the go and probably not the most discreet for use in public. I would say this is the best vaporizer for home use, at least when it comes to direct draw. If looking for a balloon vaporizer, the MiniVAP will not be the one for you. Though it is on the larger side of the spectrum, it definitely vapes with the best of em. The laminar heat flow is no joke and you can see how consistently the herb is vaped when removing it from the chamber after use. Full extraction with every session! It does take a few minutes to reach the selected temperature, so you do need to have a little time available to sit down and enjoy the MiniVAP. It cannot provide quick sips of vapor in the same fashion as the Magic Flight portable. Honestly, I find myself vaporizing at home for the most part, even with my Arizer Solo. The MiniVAP has quickly become my go to vape when lounging around on a lazy Sunday. While it heats, there is enough time to get some herb ready and the bowl packed. Once the light stops flashing and indicates it’s ready for use, a long & steady draw will create clouds! Though it comes with a rather high price tag, the MiniVAP truly is the standard of high quality in the vaporizer industry. 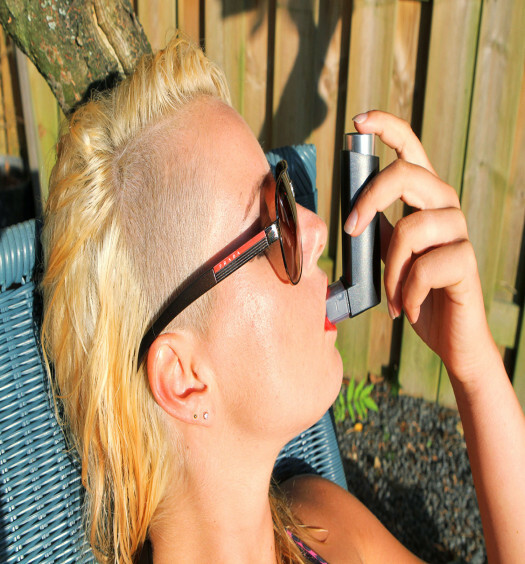 The MiniVAP can be purchased directly from the manufacturer’s website. If your favorite style of vaporizing is direct draw and you only want the best, then the MiniVAP is the perfect option. When looking for a quick heating unit that is discreet, it may be a good call to consider a different vape. MiniVap is a ripoff. Mine broke after six months so I sent it in under the supposed “two year warranty.” That was in March. Now it’s nearly August and still I don’t have no repaired unit, no replacement, no refund. The company says it broke from “normal use” so expect it to break every six months, requiring repair or replacement. The “two year” warranty apparently means nothing. Don’t waste your money on this brand. It should be put out of business.